Audi now employs two generations of Spocks as spokesmen and Axe body spray hawks a space voyage sweepstakes to hormonal jocks with tshe promise that chicks dig astronauts. Tired of ninjas, pirates, robots, and zombies, edgy advertisers appear to have set their fad-hungry gaze on space as the current (if not final) frontier of Awesome—the somewhat-undefinable quality that high-fives our inner ten year-old. And maybe an aging generation of underfunded aerospace engineers is wise to seize the moment as a bid for relevance; after all, it was the media-savvy Comic-Con set who pitched in last summer to buy up Nikola Tesla’s old lab and convert it into a museum, spurred on by a Kickstarter Project that cashed in on the late scientist’s re-branding as Awesome. So, to those of us who clicked on astronaut Chris Hadfield’s now-viral YouTube video of the song that he recorded in a space station, what followed was a surprise. A piano gently pined with seventh chords as we saw our slowly turning planet from orbit. Then, balding and with a speckled mustache, Hadfield appeared onscreen and sang in a boxy, thin warble, “Ground Control to Major Tom.” Hadfield’s zero-gravity performance of David Bowie’s classic “Space Oddity” appears to reach back to the lunar landing of 1969, but viewed from this moment of identity crisis in our culture’s own sense of “progress,” it does so with remarkably little preciousness or delusion. Hadfield manages to sing a wholly different relationship of humankind to its future than the Audis and Axes of the Internet would have us imagine. The proto-glam original of “Space Oddity” may cast the singer as Major Tom, but David Bowie’s musical storyline has always been that of the alien. Hadfield stages none of Bowie’s dire theatrical camp and instead focuses on the humanness of his last five months aboard the International Space Station. The 46-year-old Canadian changes lyrics here and there, replacing the song’s inflections of sci-fi and tragedy with references to the ISS Soyuz’s hatch and a simple assurance that “our commander comes down back to Earth,” revealing that the banal factuality of space needs no dressing up to seem remarkable. When he sings, “I’m floating in a most peculiar way,” there’s no trace of druggy psychedelia because we literally see him floating, sans special effects. Up there, everything is a space oddity. Hadfield understands this and is keen to share it—as is clear in the video where he giddily demonstrates to a science class back on Earth what it’s like to wring out a wet towel in space. Little wonders like this are easy to lose track of because the media, politics, and economics have rendered space no longer the promising future that it once seemed. In fact, I’d be far from the first to acknowledge that somewhere amid the oil crises of the 1970s, the end of the Cold War, and having crossed the symbolic finish line of the millennium, the very idea of the future lost its shine. In January 1986, I sat before a big screen TV with 20 fellow first-graders to watch the Challenger launch. Our school had primed us with a tremendous lead up to the event as a matter of pride in Christa McAuliffe—a teacher from our own little state of New Hampshire. We’d built a papier mâché space shuttle and there was cake. We didn’t really understand what happened next, but we knew it wasn’t supposed to go that way. As for culture at large, cynicism descended fast. Keith LeBlanc’s 1986 single “Major Malfunction,” for example, lays down a metallic shuffle beat and samples Reagan’s assurance of “space pulling us into the future,” pitting it against repeated clip declaring “technology works” while its music video juxtaposes the Challenger explosion with mushroom clouds. That day might not have been the singular end of western culture’s belief in space exploration as manifest destiny, a wide-eyed and righteous progression into the endless wonder of our own inevitable fulfillment. But it surely dealt a blow—especially because around that time my classmates and I started spending our lunch break huddled around the school’s first computer, which promised that the future lay more in the infinitesimal than in the infinite. But if Chris Hadfield’s “Space Oddity” is too maturely earnest to be labeled as Awesome, then it’s also too forward-looking to hear as nostalgic or mourning. Musicians Joe Corcoran and Emm Gryner made the instrumental backing track glossy enough to seem sonically less like post-2000 rock (where pianos and strings aim for rugged indie authenticity above shininess), and more like the neo-symphonic scores of post-2000 videogames—seemingly the last corner of pop culture as-of-yet unconquered by Instagram retro aesthetics. Hadfield’s verse about returning to Earth is no less literal than his floating; he landed yesterday, but hints at the continuation of humankind’s explorations. Remarkably, by recording this song in space, alone amid all the unglamorous gray stuff of functional technology, he has removed the sheen of the metaphorical and made it intensely personal. The song is no longer epic, and we should be glad because given the way “epic” has been fully conscripted as a synonym of Awesome in recent years, this allows us to strip space and the future of its needless and jokey faux-bigness. Instead, through this intensely personal reflection on real time spent in real space, Chris Hadley reminds us the future’s wonder can and will exceed the facile fuzziness of memory and the inarticulate thing we call “hope.” He reminds us that whatever lies ahead is not an awesome advertisement, a hipster wisecrack, or an historical eulogy; it’s there to grasp and feel in all its realness. 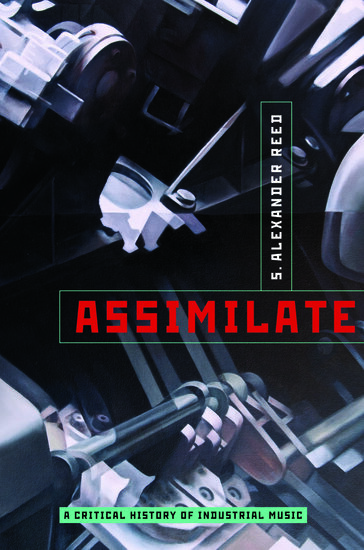 S. Alexander Reed is a professor and musician. He is the author of Assimilate: A Critical History of Industrial Music (Oxford University Press, June 2013). I think, though, that he was born in August, 1959, which would make him almost 54, rather than 46. A nice read. And I’m really enjoying the video. Note that the reference in the song is to “Soyuz hatch” not “sawyer’s hatch” – the name of the Russian capsule that transports the astronauts to and from the station. Thought I should point out (before the more vitriolic pedants descend) that it’s not sawyer’s hatch but rather Soyuz hatch. Wonderful post!